This has been a pretty busy day but just wanted to stop by and share my Valentine's day freebie with you so that you could use it this week! 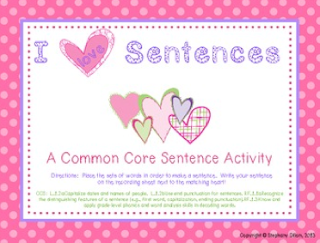 It is a sentence unscramble activity that is great for rotations and stations! I hope everyone is having a great Valentines Week! Click on the pictures below to head over to TpT to download! Head on over to Classroom Freebies to check out some other great freebies! I found you through the classroom freebies linkup. I love your blog design layout :0)!